If you haven’t heard about the convergence of Thanksgiving and Channukah this year, then the Internet has failed you. Just last week, the Kosher Connection linkup was dedicated to the best of Thanksgivukkah recipes and Melinda has an amazing collection of recipes for this holiday over at Kitchen Tested. My ultimate Thanksgivukkah latke was dreamt up about a year ago. Sitting next to a buddy of mine in Synagogue I came up with the idea of the ultimate latke. 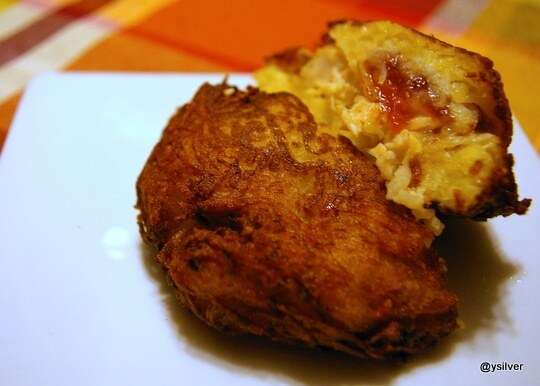 A latke that had it all. 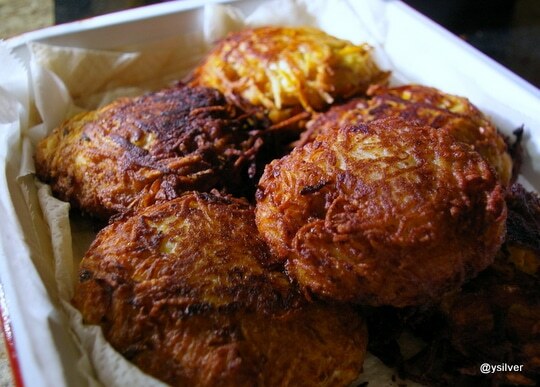 The KOL Latke. Not only is kol the hebrew word for “all” or “whole”, but my awesome friends at KOL Foods supply the best meat and poultry that I believe you can buy in the US and that’s exactly the sort of meat this latke deserves. 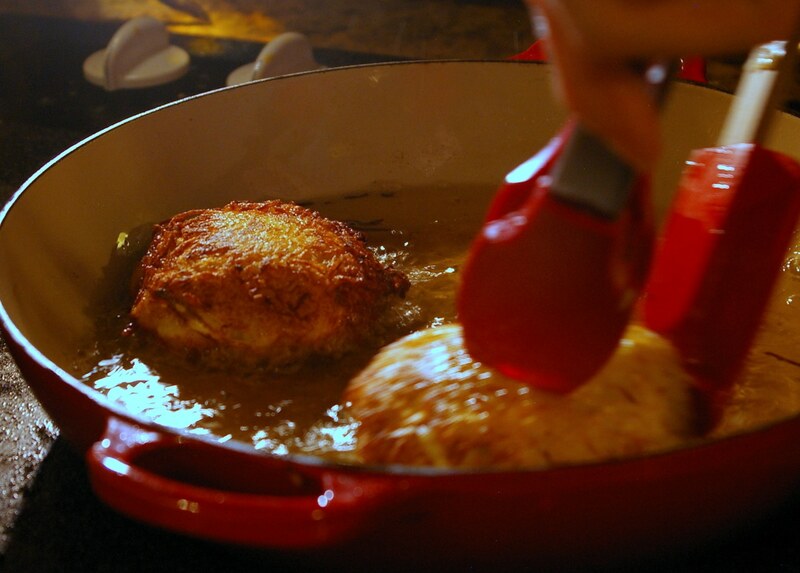 My Kol Latke is stuffed with roast turkey breast and cranberry sauce. I don’t think there’s anything missing there! Information! Here are some more of my Chanukah recipes. Throughout the week of Channukah, eight food writers will be sharing recipes perfect for that leftover Thanksgiving turkey. When the week is over, you can vote for your favorite Thanksgivukkah combo and you’ll have the chance to win $200 credit so you can try to make some my KOL Foods recipes. You can learn more about how you can win over at the competition homepage. I didn’t know how I was going to stuff a latke with roast turkey and cranberry sauce and in making this dish, I think I have learned two secrets to making the perfect latke. First of all, per this recipe, I used cheesecloth to squeeze as much liquid out as I could. Secondly, I made sure my oil was really hot when I started to frying. I cooked my turkey breast for this recipe but it would just as well if you want to use leftovers from your Thanksgiving table. You could also use thigh or leg meat if that’s what you have. The other big question I couldn’t answer was how I was actually going to build this beast of a potato pancake. These are not you thin and crisp latkes, the finished product was a couple of inches thick so they are crunchy on the outside but the inside stayed soft. Essentially I sandwiched a slice of turkey and cranberry sauce in latke patties and made sure I could completely seal the edges. This latke was fun to build and cook but I knew that it would be challenge to keep the oil hot, form the latkes and take photos at the same time, so I invited my friend Joel, to be my photographer for the evening and there were plenty of great photos for me to choose from by the time we were done. 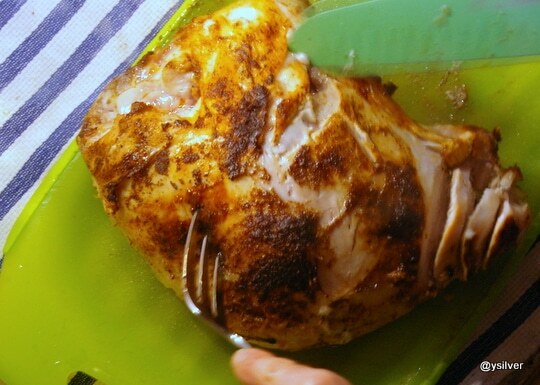 Roast your turkey breast at 400 degrees until the internal temperature reads 170 degrees. 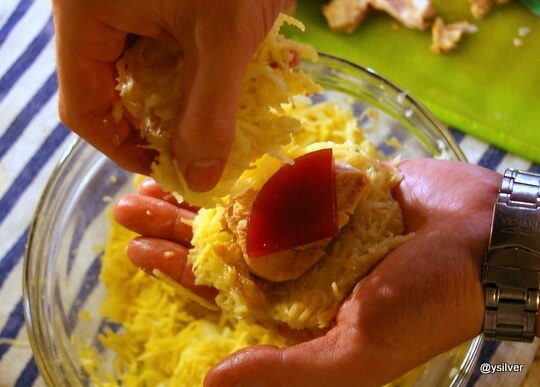 Peel your potatoes and finely grate using a food processor. Grate the onions too and season with salt and pepper. 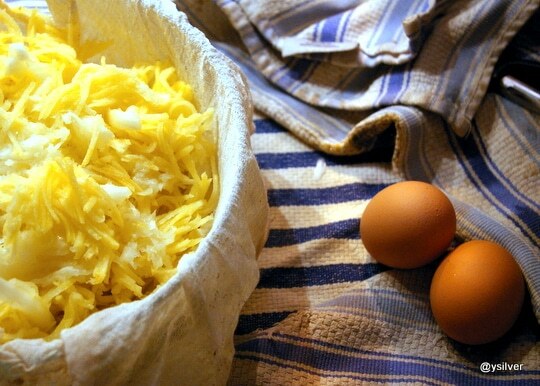 Line a bowl with cheesecloth and pour your potatoes and onions on top. Squeeze out all the liquid, then add the eggs and breadcrumbs. Mix. 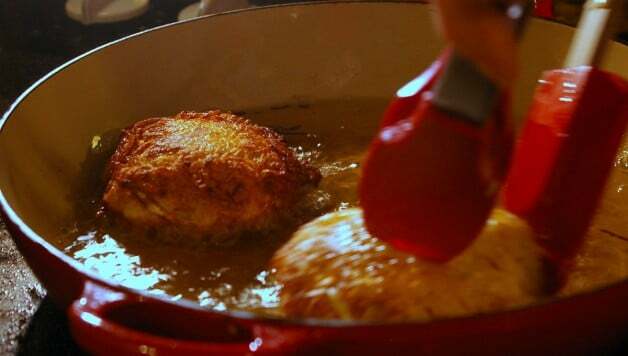 Form your latkes by sandwiching your turkey and cranberry sauce with potato patties and makes sure the edges wrap around the turkey and cranberry sauce. 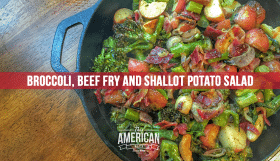 Fry on each side for five or six minutes or until golden brown. KOL Foods is the only source for domestic, 100% grass-fed, kosher beef and organic, pastured, kosher chicken, turkey and duck. We also provide, grass-fed no-nitrate deli and sausage as well as grass-fed lamb and wild Alaskan salmon. 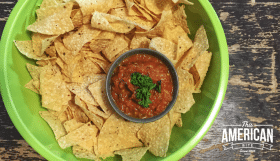 KOL Foods’ products connect to tradition, the land, a sustainable future, and good health for friends and family. We know our farmers and tell the story of their animals. KOL Foods is committed to kashrut, transparency, the environment, animal welfare, health and offering the most delicious meat on the market.